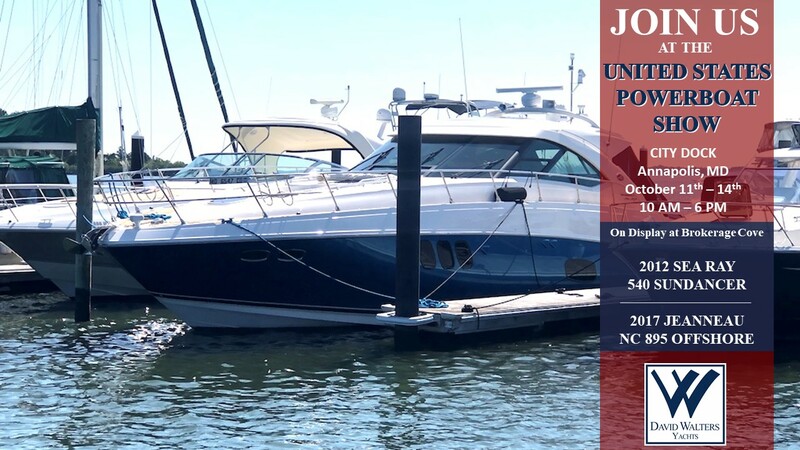 In October boaters from across the country gather in the historic seaport of Annapolis to shop from all major powerboat manufacturers, climb aboard more than hundreds of center consoles, and tour brokerage boats. Attendees try before they buy at the Demo Dock and enjoy a drink on the Pussers Painkiller Party Barge. This is the best place to purchase boating supplies, navigation equipment, fishing gear, clothing, and marine accessories. There is something for everyone! The David Wallters Yachts Display at Brokerage Cove will include 2 of our premier powerboat listings! 2012 SEA RAY SUNDANCER 540 "LAWLESS"
LAWLESS is by far the best equipped and maintained Sea Ray 540 Sundancer on the market, and is arguably the most highly optioned 540 Sundancer built. Her equipment list is extensive with many custom additions to make her a highly capable vessel in and off shore. Features included Upgraded Cummins 715 CMD QSM11 Engines with Zeus Pods and Skyhook, Transom Passarelle System, Forward Sun-Pad with Fold-Down Bimini, and much more! ONCE AROUND is your opportunity to own a fully optioned and more NC 895 that still smells and looks like new! You can't get a new boat optioned like this until 2019! Only 50 hours on the engines and professionally maintained. The Jeanneau Merry Fisher NC 895 is the modern, European styled take on the popular down-east/pocket cruiser market. Combining cutting edge designs, performance, and outboard power into a swift, easy to own vessel.